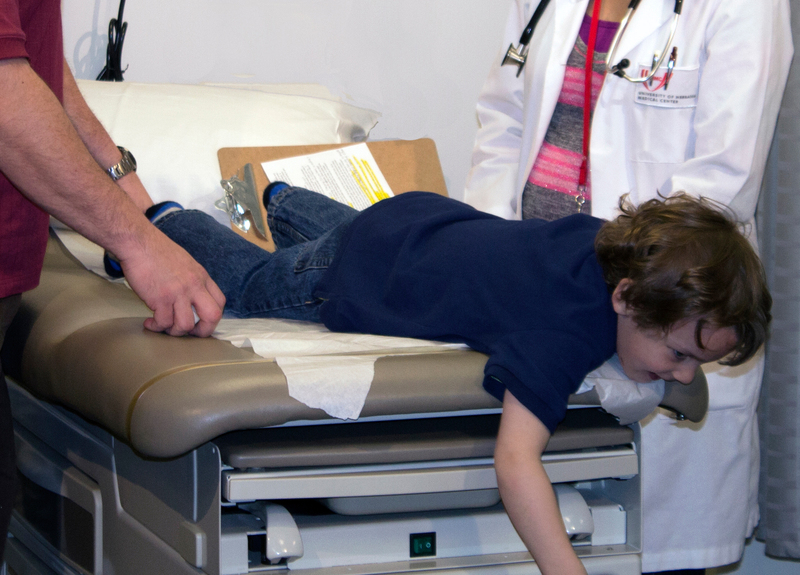 The decision to diagnose a child with ADHD can be difficult. Behaviors displayed by children of all ages can be caused by various reasons, and can be compounded by parental and school influences. How can providers be sure to differentiate between normal and abnormal behaviors, and to diagnose clinical problems accurately? With treatment, children with ADHD can lead a happy, healthy, and productive life. 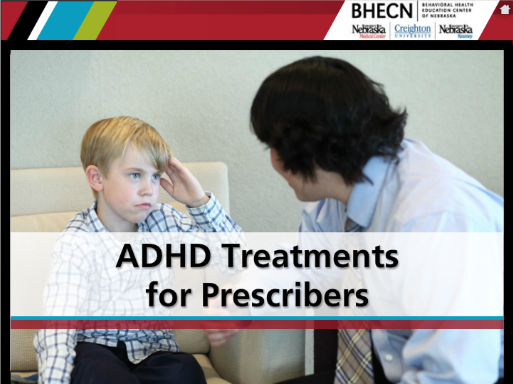 In this interactive module, you will learn about medication options used for ADHD to include stimulant and non-stimulant medications, the common properties of these medications, and how to determine which drug is best for various situations using a case study approach. This module provides a practical course on the diagnosis and treatment of adolescent depression for health care practitioners providing front line care to patients. A behavioral health screening tool is a routine assessment of health and well-being that helps clinicians identify problems early. 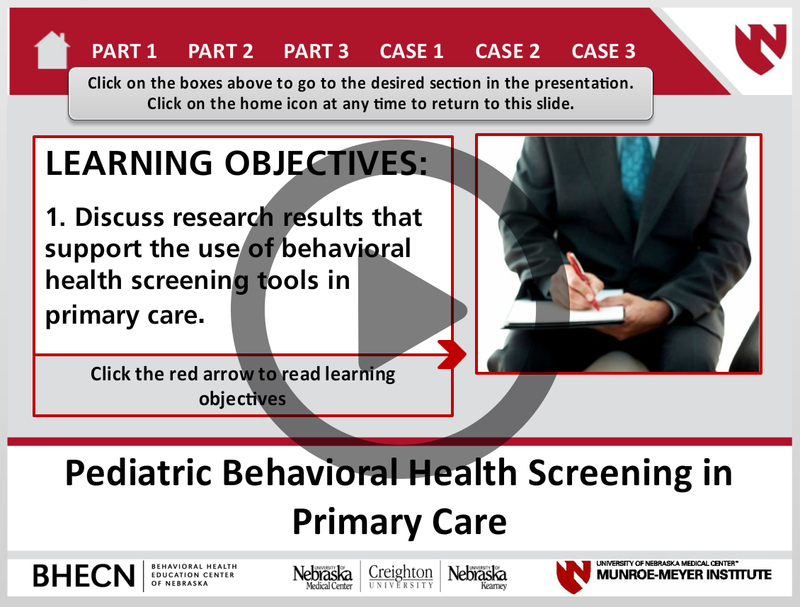 In this interactive module, you will learn why screening tools are effective in identifying behavioral health concerns, what tools can be used, and how to incorporate them into practice. The module will also explore what actions to take when a screening identifies a potential issue through case studies involving children of different ages. 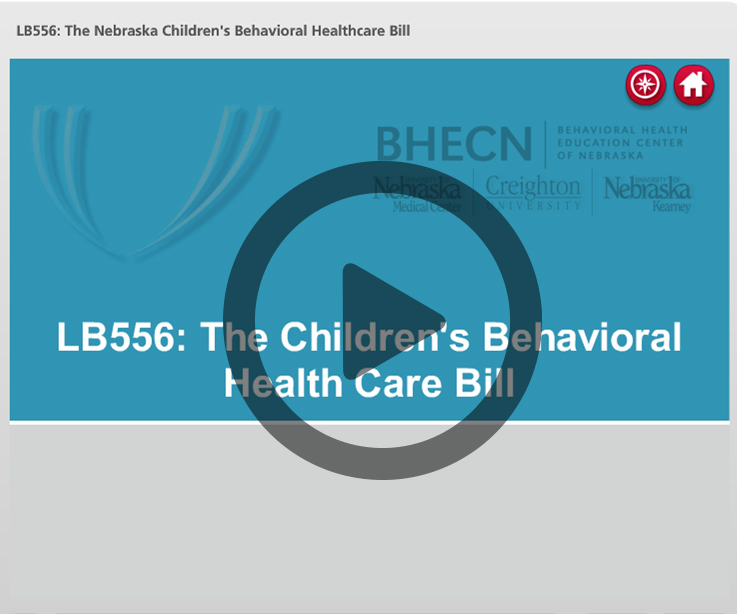 In this interactive module, you will learn more about the bill that created the children’s behavioral health screening program, LB556. The module will also discuss the need for increased access to behavioral health services, review the elements of LB556 as written in the law, and describe how these elements are working in clinics across Nebraska. Telehealth use is expanding all over the country, connecting patients to services they need, but are not able to access in their community. “Can I really form a therapeutic alliance with patients in a session conducted with telehealth? “Is it really as effective as face to face sessions? "Why would I want to go through the trouble of setting up telehealth? “Will this actually grow my practice? 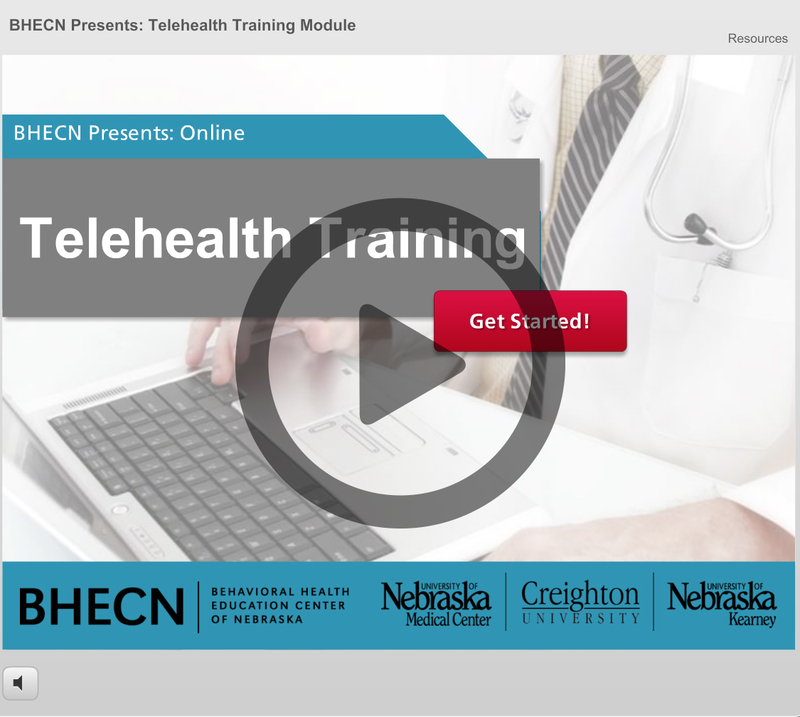 In this interactive module learn about telehealth evolution and its current use and answer these questions. The module will also identify various indications of behavioral telehealth service delivery, describe telehealth etiquette and best practices, and demonstrate basic skills necessary to navigate the use of a telehealth platform.